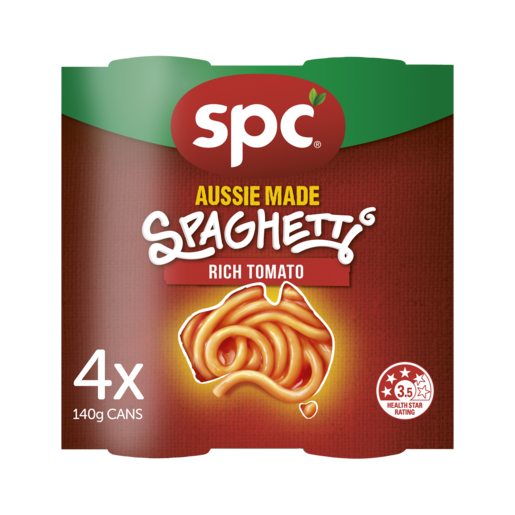 SPC Spaghetti rich tomato is an Aussie made. Pasta (Wheat Flour) (50%), Rich Tomato Sauce [Tomato puree (29%), Water, Sugar, Thickeners (1412, Maize Starch), Salt, Canala oil, Natural flavours, Vegetable Powder, Colour (160c), Food Acid (Citric), Antioxidant (Ascorbic acid)]. Made in Australia from 99% Australian ingredients. SPC Baked Beans Rich Tomato is Aussie made.